Summary: Liza and Jeremy (twins) are awakened by a storm one night. In fear, they run to their mother. In response their mother tells them the story, told to her by her mother, of the invisible string. This string forever keeps them connected to her and all they love despite where they find themselves. As a result, they are never alone. 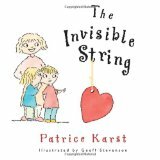 Literary elements at work in the story: Two primary themes used in The Invisible String to get the message of this story across are illustration and dialogue. The children are in dialogue the entire book with their mother, questioning the reality of the invisible string’s ability to keep them connected. In this dialogue the kids ask a series of questions centered on location. The author uses very vivid and colorful pictures to bring to the life these various locations. With each challenge the mother responds “even there”. How does the book present gender, race, culture, economic status, abilities/disabilities, age, etc? : The story presents the children as paternal twins, one male and one female. The mother is represented, but no father. All three of the main characters are blondes but in one image where the twins are dreaming of their friends, the images show a greater variety of gender and ethnicity. Images in the story indicate the family has a laptop and a car and a comfortable house of apartment, so the basic image is one of a family that has a somewhat comfortable economic status. Theological conversation partners: The discomfort and fear of being alone is one we grapple with in this life often. It is even a question addressed in scripture. We find in scripture, both the Old and New Testaments, that God is active and always present in our lives. Though we may feel alone we are never alone. Jesus promises us in Matthews 28:20 that he will be with us until the end of time. Jesus also promises us in John 16:7 that in his absence he has sent the Comforter, the Holy Spirit to guide and be with us. It is the Holy Spirit, much like the invisible string, that assures us we are never alone and that we are always connected to the One who loves us. Tell about a time you felt alone? Why? In that moment to whom did you reach out for connectedness? How do you believe you would have felt if you had no one to reach out to? Does our faith assure us of connectedness? In what ways? Given we are assured of God’s constant presence how should we respond to anxiety caused by the prospect of being separated from those we love? The Invisible String by Storypath is licensed under a Creative Commons Attribution-NonCommercial 4.0 International License.